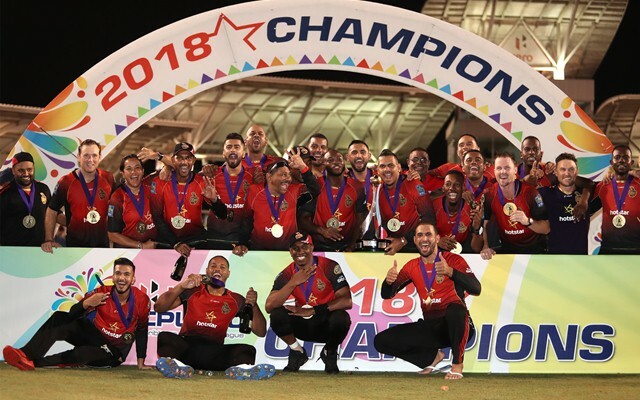 Trinbago Knight Riders became the first team to defend the title in the Caribbean Premier League (CPL) as they defeated Guyana Amazon Warriors in the final by eight wickets. The Knight Riders chased down the target of 148 to record the highest run-chase in a CPL final surpassing their own record of 136 in the previous edition. Khary Pierre’s 3/29 restricted Guyana to 147/9 who were cruising at 78/2 after ten overs. Colin Munro continued his rich batting form in the tournament with an unbeaten 68 off 39 deliveries as his team chased down the target with 15 balls to spare. 0 – Guyana Amazon Warriors are the only team to feature in four finals in the CPL but ended up as runners-up on all the occasions. They lost batting first in 2013, 2016 and 2018 while the winner of the 2014 season was decided by the D/L method when Guyana were 107/4 in 15.5 overs chasing 153 but were 8 runs behind the par score. The Trinidad franchise won in all the three finals they played in the CPL to become the first team to win three CPL titles. They were named Trinidad and Tobago Red Steel when they won the title in the 2015 edition. 3 – Dwayne Bravo has led in three tournament finals in the T20 cricket; all for the Trinidad franchise in the CPL. He is now one of the seven captains in the Twenty20 cricket to have 100% win record in the T20 final with a minimum of three matches. Only Rohit Sharma (5) and Imran Nazir (4) are ahead of Bravo. 12 – Dwayne Bravo now has been a part of 12 wins in the Twenty20 tournament finals which is the joint most for any player along with Kieron Pollard. Bravo featured in 17 T20 finals thus far while Pollard played in 20; the most by anyone. 22 – Fawad Ahmed’s 22 wickets in the tournament are the 2nd most number of wickets for a player in a CPL edition. Dwayne Bravo claimed 28 wickets in only 13 matches in the 2015 season also for the Trinidad franchise. 54 – Colin Munro hit as many as 54 fours across the 13 matches he played this season. No other player has hit more than 40 fours in a single edition of the CPL. Kumar Sangakkara hit exactly 40 fours when he scored 379 runs in the previous edition of the tournament while playing for Jamaica Tallawahs. In addition to the 54 fours, Munro also hit 24 sixes which are the joint 2nd most number of maximums for a player in this edition. 567 – Colin Munro became the first player to score 500 runs in a CPL edition when he got his first run in the final. His 567 runs in his season are 109 more than the previous most runs in a single CPL edition. Chadwick Walton aggregated 458 runs in the 2017 edition for Guyana while Glenn Phillips came close this year with 457 in only 11 matches for Jamaica Tallawahs.